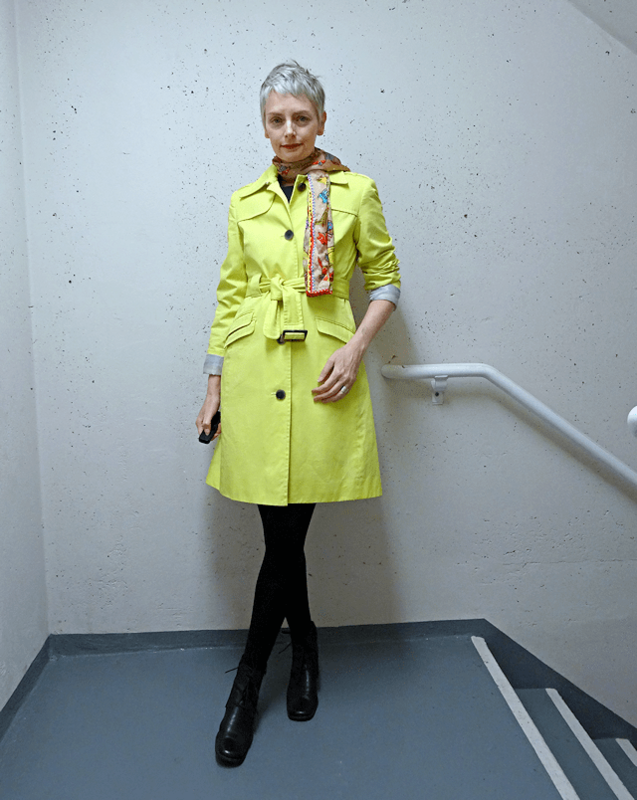 I love the idea of bright bold outerwear rather than greige or oatmeal which only make me look and feel ill. Wearing bright bold coloured outerwear is the Red Bull of style. It takes it up a notch and makes everything electric. I scored this satin trench coat by Bebé thrifting a couple of weeks ago. For most of my life I never wore orange. After I started dying my hair red that colour took over my closet. It is surprisingly a wonderful colour for most complexions if you can manage to find the correct shade of orange. I stick with earth tone, rust orange most of the time. I’m using a simple style trick here to create this outfit, choose one patterned item and then use the colours in that pattern to build the rest of your outfit. If the colours in the pattern work well on the blouse, you know they will work well on the rest of the ensemble. This style trick is a guaranteed no fail recipe for fashion success. I consider an outfit a success when it makes me feel good about myself and happy when I look in the mirror. This silk blouse was also a great find at the thrift store. It is actually a short tunic with pockets. It looks new. I am always surprised by the amazing pieces people choose to dispose of. Here are some of my other favourite bloggers and friends rocking some seriously colourful outerwear. Greetje also likes bold coats, particularly streamlined shapes. Honestly Sue has one of the BEST and most unique coat collections I’ve ever seen. She is a brilliant seamstress and sews most of her own clothes. It was hard choosing just one coat of hers to feature, she has so many, and like me, she adores colour and patterns. Also…can you imagine that she also made her own buttons for this coat? No joke! Impressive right? The only person in the world I know that can look this incredible wearing neon yellow. 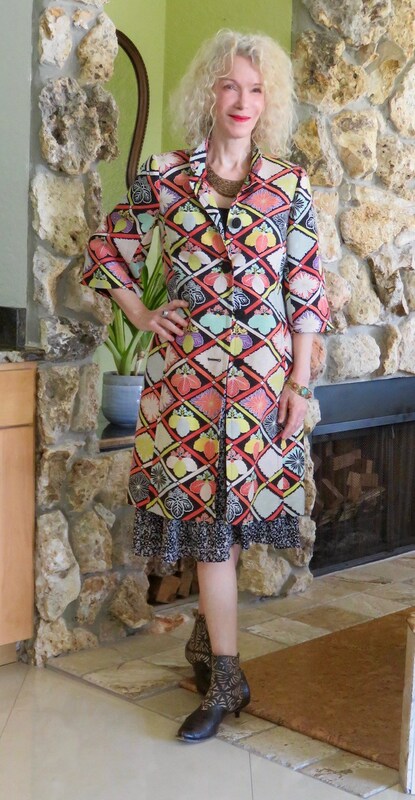 Patti is an avid thrifter like me and scored this amazing Trina Turk printed coat via thrift. Truly this is a dream coat. I’ve seen Catherine sporting some pretty fabulous coats but this bold colour combo really made me smile. Anna has wonderful eclectic tastes. This coat she picked up recently is such a stunner. Are you a lover of colour and pattern when it comes to your coats? I agree, I’ve become addicted to thrifting. Ooooh…I love a statement coat. Why would one blend into the background with a khaki or black coat? And the other reason your outfit is hitting a 10 on my rating? It’s blue & orange—Broncos colors (football in case you’re not a fan)!! I probably get rid of clothing like you described….there is only so much room in the closet, thus one in/one out!!! Ha ha! Glad you pointed out that was for football. I don’t follow sports of any kind. My husband follows world soccer once every 4 years and that is about it. I consider myself blessed that I married a man that isn’t obsessed with sports. I absolutely love that blouse! The pattern is so perfectly eyecatching. You are the master of thrift finds! And if one lives in a cold climate where jackets are a must, they might as well look cool! It was the bold colour and pattern that attracted me to the blouse. When I touched it and found out it was silk I knew it was coming home with me. You look great. A simple way to create an outfit and you do it so well. Orange is awesome and it rocks with your hair. Have a wonderful week. Your outfit looks fantastic! 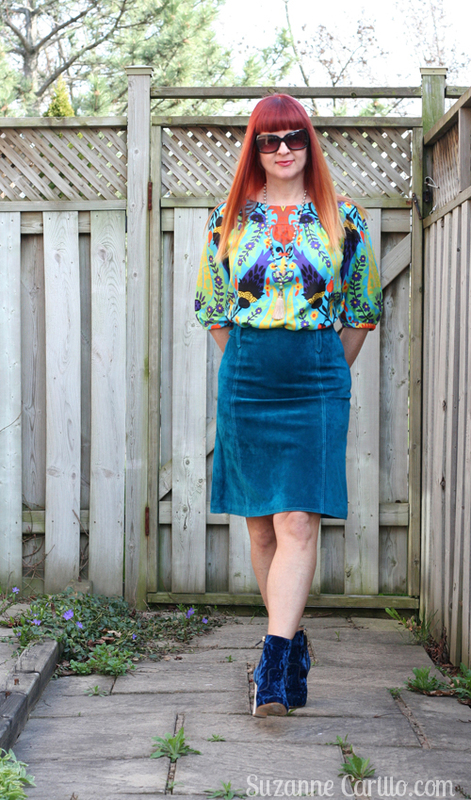 I especially love the blue suede skirt. I love bold statement items but have to balance it between items that are classic staples to keep spending to a minimum! You wouldn’t like my closet then. Only statement pieces! LOL Yes I have a problem. Color is a tool and you wield it well. Bright colors look great on you. Great new purchases, I love all the textures in your outfit. I have stopped buying any coats since the leather jacket I bought that I saw on you because I just don’t get enough use of them. I do have a big collection of blazer that I would consider more as outer wear and they come in all colors and patterns. If I didn’t need coats I would have so much more space in my closets! Such lovely coats! I’ve been trying to embrace color more, because I’m always drawn to it. And I do look better in bright colors. Love this whole outfit – and all your coat picks! I love your “new to you” pink trench coat. Such a wonderful pastel colour. Colours look very nice on you! And the orange coat was a great pick!! Blue and orange is one of my favourite colour pairings, and it looks marvelous with your hair. 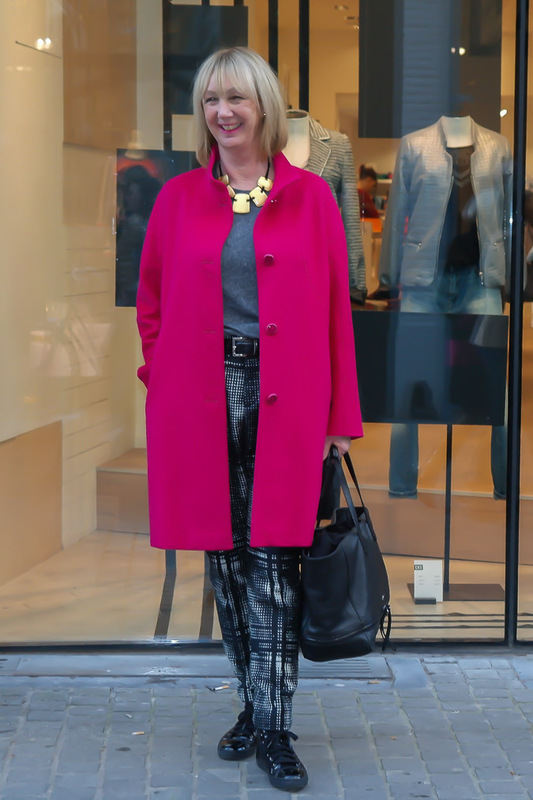 Most of my coats are either a bright colour or pattern – my favourite is my hot pink Betsey Johnson down-filled coat. I have a bit of a coat problem, and am always looking for the next fabulous one. I love Sue’s polka dot coat! I do have a couple of trenches in black that work well on me. I’m not against a nice grey, but normally I prefer darker shades of grey. My Mom still wears greige. ALL THE TIME. I cannot convert that woman no matter how hard I try. You would have seen those booties on repeat. They are so spectacular. I just wish they weren’t so high. More than 5 minutes walking in these babies and I need some serious drugs. They are restaurant shoes. Walk inside, sit down. Walk outside, sit down in the car. Walk into the house. That is it. Thank you so much for the feature Suzanne! 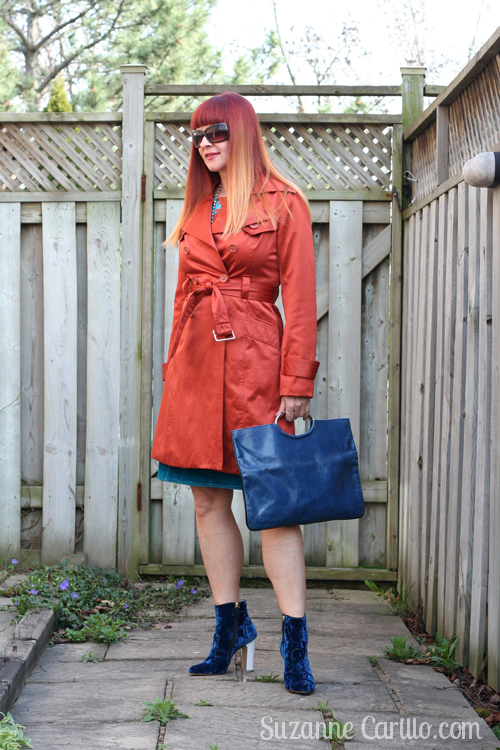 ‘Tis true…I can’t be sad when I open my coat closet; there’s so much happy colour in there! All of these coats featured would be welcome additions! Like yellow…orange is about the right orange for you, and you’ve mastered your hue! Your style trick is a keeper!! Just how many coats do you own now? Don’t let her count, you will make her feel embarrased hahahaha. 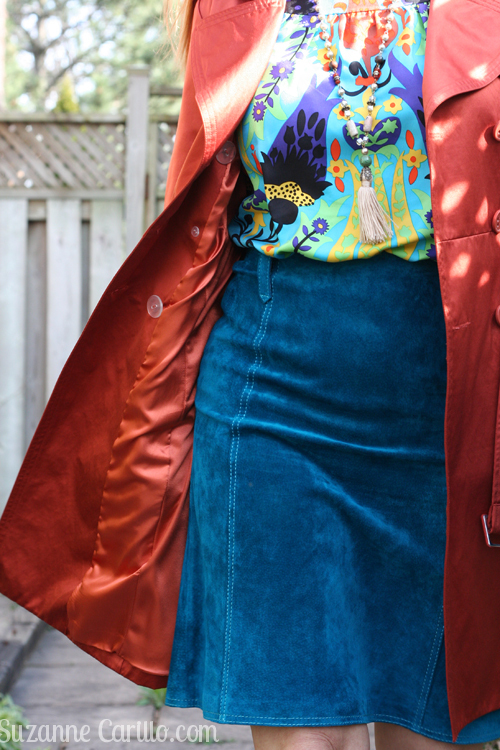 We’re in coats most of the year so it makes sense to adorn oneself in the brightest one can! I love yours, what an incredible find. It looks an absolute dream with those killer boots and fabulous skirt. Only you would have a vintage plastic rain cape in florescent orange! LOL I LOVE it! You have an awesome coat collection. I thought this beauty was leather but love that it’s satin, even more unusual and lovable. The pairing with those vivid blues couldn’t be better. And those Elvis boots! – I adore those!! Thanks for including me in your lineup! Mwah. I love all the coats you’ve featured here. Sue is a goddess because she can sew her own. Unbelievable. I know – the things people give away, but aren’t we lucky?!! I love the orange accents in your silk tunic/top. Yes, that is why thrifting is so addictive…you never know the next great treasure you will find. I actually really adore bright outerwear (which is weird then that I don’t have any. Must change that sometime.) and this orange color is always really pretty on you! That orange is so your colour, stunning. I could not imagine you wearing beige… that would not suit your personality at all. To my big surprise I see myself. What fun. Thank you dear. Now I feel even more ashamed I haven’t been to your blog for a while. Why can’t you all post once a week? I feel exhausted, really. But I love the coat and especially the blouse (tunic). Very beautiful. Nice styling with the velvet boots. Your coat and boots are amazing! I love blue and orange together. <3 Love Catherine's outfit, too! So many unexpected colors! Very cool! Well, I’m all for bold coats! What a fabulous selection here. They surely do add va va voom to any outfit. What a score yours is Suzanne. Fantastic colour especially against the denim and those gorgeous velvet booties. Well I’m all for brightly coloured coats! And yours is a great score. The orange looks fantastic against the denim and those velvet booties. And what a great selection of coats, proving that a colour just adds va va voom. We had a blogger meet up yesterday in London and Greetje flew over. She was wearing a beautiful yellow patterned coat. What a star!